As the Moderator Dr Hiranthi Wijemanne said, this is largely about the views of those present, so I will be brief. This Analysis dwells on four areas, with regard to three of which, Child Development, Child Protection and Health, we can I think be relatively satisfied. Though more remains to be done, we have certainly improved our record in all these areas, and I should note the excellent work being done now by the Ministry of Child Development and Women’s Affairs, through its imaginative and caring Secretary, and the support he receives from the National Child Protection Authority and the Probation Department. In fact I have just come from a ceremony arranged by the NCPA to appoint representatives to every Divisional Secretariat, and I can only commend the commitment of the NCPA Chairperson, who is determined to establish consistent standards islandwide. I am sure the Ministry will issue guidelines to entrench the coordination this Analysis suggests must be improved, while also ensuring that remedial measures are taken where there are shortfalls. With regard to Health, I think the contrast the Hon Sarath Amunugama drew with Education, is something we need to think of seriously. Clearly he believes, as I do, that we can be relatively proud of our record in Health, where it seems that year by year things are improving. Sadly, with Education the opposite holds true. Because of both the National Human Rights Action Plan, and Reconciliation work that involves meetings at distant Divisional Secretariats, over 50 in the last year, I have become deeply conscious of the gaps in our systems with regard to protection for Women and Children. Most obviously there is a woeful lack of coordination of the various agencies and personnel supposed to work in this area. But equally worrying is the absence of such personnel in most places. This has been brought home to me more forcefully, following the suggestion of the Secretary to the Ministry of Child Development and Women’s Affaris to set up Women and Children’s Units in each Division. I now check on what human resources each Division have, and I find none that have officials in every area. This is true of many fields. After the very productive discussion between the Secretary of the Children’s Ministry and the Secretary to the Ministry of Social Services – whom I had known in another incarnation as the courageous and efficient Government Agent in Mullaitivu and then Jaffna – I looked also for Social Services and Counselling and Welfare Officers, in addition to Women’s Development and Probation and Child Rights Protection and Early Childhood Development Officers. But more often than not these too are lacking – and the same goes for Sports Officers and Cultural Officers too. In some places there had been Officers on probation, but they had left to take up places in the latest Graduate Recruitment Scheme government has begun. That absurdity made me realize how bizarre this scheme was, though I had already had inklings of the confusion caused in many officers by hundreds of these new recruits, for whom jobs had to be found. Much dissatisfaction is created by the sense that government is distant, and decisions are made without consideration of local wishes and needs. Explaining government decisions, and why delays are inevitable even though planning is based on a commitment to equitable development, often relieves feelings. A second problem is resentment of perceived corruption. Enhancing accountability, and providing opportunities to discuss expenditure, with concentration on outcomes and value for money, would reduce resentments. Confusion is also caused by overlapping areas of responsibility. Though the Divisional Secretariat was intended to be the primary unit of administration, functions impacting strongly on people are based on different areas of responsibility. These include the police, education and health. This makes coordination difficult. Strengthen Local Government Institutions and give them full responsibility for administration of functions closely affecting the daily lives of people. These include education and vocational training, health and sanitation, local roads and bridges and transport, water supply and drainage and waste management, markets and agricultural extension work. Addressing concerns of the international community systematically – is it possible? I was told recently by a friend that he felt we were not actually addressing the concerns that had been raised with regard to Sri Lanka. I was surprised, because I thought we had been doing this throughout. However, I could see that, in assessing the methodologies adopted to attack us, we might have been distracting attention away from simple facts. It might be useful therefore to record specific concerns – but in doing so it will be clear that, the moment one concern is addressed, another is raised, sometimes with blatant inconsistency. 1. There was concern that we would hold the displaced indefinitely in what were termed internment camps, and not resettle them. We pointed out three reasons for keeping them in welfare centres, which were by no means internment camps. The term internment refers to taking people from their homes into custody, whereas we were dealing with people who had been taken from their homes, which were in heavily mined areas. Some of those people were security risks given their involvement, whether willingly or not, in terrorism. Apart from security checks, we noted the need to demine the areas to which people were being returned, as well as the need to restore at least basic infrastructure. 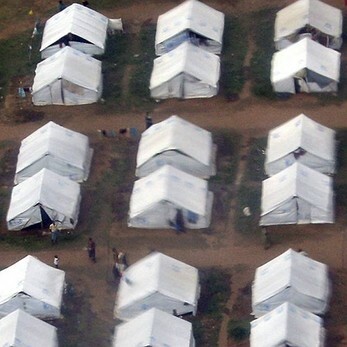 Now that that has been done, all but 10,000 of the displaced have been resettled. As a result, we got little assistance initially, except from the Indian government, for demining. We therefore spent a massive amount of money on equipment – after which UNHCR also donated five or so machines, far fewer than the 25 or so we had bought. Our army did most of the demining required, and we were able to begin resettlement within a few months. 3. Subsequently concern was expressed that we were resettling too quickly, without proper attention to demining. Since resettlement began there have been hardly any mine related incidents in the areas of resettlement. I believe, apart from the death of a foreign demining expert, there was only one casualty in the Wanni last year, a boy who had been sent to collect firewood in an uncleared and marked area, whose leg was blown off.